The match between the Bulls and the Jaguares in Pretoria was decided in the last ten minutes. For the Bulls, it was suicide rather than simple defeat. They were leading 20-10 with seven minutes to play when they were penalised for holding on at a tackle. The Jaguares kicked out but then the TMO advised the referee to examine what else had happened at the tackle. There, for all to see, was Tim Agaba of the Bulls, charging, shoulder first, into the neck and head of Rodrigo Bruini of the Jaguares. The referee yellow-carded Agaba. The Bulls kicked off, Bruini jumped for the ball and prop Conraad van Vuuren tackled him in the air and was yellow-carded. 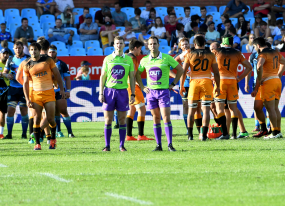 That Van Vuuren was a prop resulted in a long delay when the Jaguares' flank Pablo Matera passed forward and a scrum was ordered. It took over three minutes before the scrum could be formed and whether or not it should be an uncontested scrum. The problem was that Van Vuuren was a prop and he had been sent off. He was a substitute/replacement. (There is supposed to be a difference between a substitute, a tactical replacing of one player by another, and a replacement, a replacing of an injured player by another player). At half-time, the Bulls tighthead, Trevor Nyakane, had jogged off but the second half started with a new prop in Nyakane's place - Conraad van Vuuren. The referee wanted to know why Nyakane's had been replaced - whether he was injured or off for an HIA or a blood injury? This related to his eligibility to return to the field. If Nyakane's had been replaced because he was injured, he was not allowed to come back. - Law 3.20: An injured player may not return once replaced. If Nyakane's had gone off for an HIA test, he was not allowed to come back because the time allowance was up. He had gone off at 48 minutes and this was some 53 minutes (actual time) later. Law 3: If the player is not available to return to the field of play after 10 minutes (actual time) of leaving the playing area, the replacement becomes permanent. If Nyakane's, had been replaced because he was bleeding, he was not allowed to come back because the time allowance was up. He had gone off at 48 minutes and this was some 53 minutes (actual time) later. Law 20.24: If the player is not available to return to the field of play within 15 minutes (actual time) of leaving the playing area, the replacement becomes permanent. But if Nyakane's had been tactically substituted, he would be allowed back as a player trained to play in the front row. Law 3.19: If a front-row player is temporarily suspended, and the team cannot continue with contested scrums with players already on the field, then the team nominates another player to leave the playing area to enable an available front-row player to come on. The nominated player may not return until the period of suspension ends, or to act as a replacement. Law 3.20: If a front-row player is sent off, and the team cannot continue with contested scrums with players already on the field, then the team nominates another player to leave the playing area to enable an available front-row player to come on. The nominated player may act as a replacement. The referee often has help in sorting this out from three other assistants - a timekeeper and assistant referees labelled 4 and 5 who each have a team to regulate the coming and going of players. There was a timekeeper and a 4 and a 5 on the sideline in this match. Maintains records of replacements and substitutions to ensure compliance with Law"